Japan's manufacturers cut production for the second consecutive month in February, and output fell month on month by 1.2 percent from January, when it also dropped by 2.2 percent, the Trade Ministry said today in Tokyo. 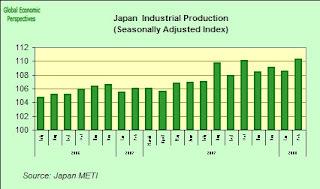 The seasonally adjusted index is now, as can be seen in the chart, at its lowest level since last July when Japan was suffering from earthquake issues. This means that Japanese output, which had been holding out - thanks to continuing strong exports - rather better than might have expected is showing clear signs of weakening. Companies surveyed said they expected production to rise by 2 percent in March before falling back again by 1 percent in April. The Bank of Japan's quarterly Tankan survey of business confidence, is due out tomorrow, and is widely expected to show that sentiment among the country's largest manufacturers fell in March to its lowest level in at least four years. The growing risk of a slowdown/recession has got investors betting that the Bank of Japan will reverse its policy and cut interest rates some time this year. Traders see a 59 percent chance the central bank will lower the key rate from 0.5 percent by December, according to estimates from JPMorgan Chase. In separate data from the Ministry of Health Labour and Welfare we learn - via the monthly labour survey, that average total monthly wages (including bonuses and overtime) were up 1.3 percent in February, following a 1 percent rise in January. This follows many months of either very lacklustre or negative wages growth, so not all the indicators are negative by any means at this point but we will have to wait to see just how sustainable this is, and what impact it will have on domestic consumption. On the employment front it is difficult to get a clear picture, since the labour office introduced a new time series in January, and not all the data we have are completely compatible, but the general picture seems to be that regular full time employment has firmed somewhat, while the rate of increase in part time work has slowed, and the numbers of temporary workers and workers on "non regular" contracts seems to be declining. If we look at the chart for total hours worked we can see that it is much more erratic than the above chart which shows the steady increase in regular full time workers, this is presumeably due to overtime factors, but it will also be a reflection of the fluctuating situation with temporary workers, who, along with part time workers, have made up a growing share of the Japanese labour force in recent years. The last chart I am presenting needs to be treated with a certain degree of caution, since it is not based on one continuous time series, and I have constructed it myself, so the break and drop after December may well not be as sharp as it appears, but the general trend is clear enough I think, and it is as theory would lead us to expect, ie that temporary workers are the first to go as the economy slows. Japan's industrial production rose rather than falling in February, according to revised data from the Trade Ministry today, reversing an earlier estimate that showed output had declined. Production increased 1.6 percent from a month earlier, compared with the previously reported 1.2 percent drop, after the government changed its measuring criteria. January output fell 0.5 percent, less than the 2.2 percent initially stated. The revision now means that production climbed to its highest point ever in February, adding to evidence that the world's second-largest economy is still resisting the slowdown. 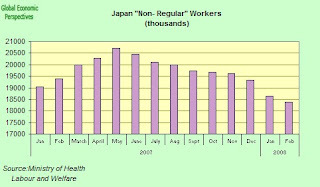 Despite our feeling here on JEW that Japan's longest postwar expansion was faltering last autumn - and possibly even heading for recession, with exports being sustained by rapid growth in some key Asian emerging economies, the Japanese economy is still hanging on in there, for just how long is what now remains to be seen. Today's revisions were mainly the result of two adjustments to the industrial production index: the base year was changed from 2000 to 2005, and the weighting of items was adjusted to reflect current production patterns. The Trade Ministry adjusts the index every five years. "As long as Japan's production remains flat it's tougher to call for a dual recession," Takehiro Sato, Morgan Stanley's chief Japan economist, who had been calling for a dual U.S.-Japan recession said. "We have to retreat from that. Having said that, we still have to be cautious about the economy going forward."